I don’t want to come off as being a stingy scrooge. Because everyone knows I love poppin’ tags and eating my dinner in a fancy restaurant as much as Macklemore and Sinead O’Connor. But being thrifty is a really handy skill to have when you’re a mum. Especially as those majestic days of having a disproportionate income-to-expense ratio have faded into beautiful distant memories. These days childcare and school fees, swimming and soccer, library fines, allergen-free groceries, organic laundry powder and the like, are the destination of our cash flow. And that’s totally cool with me. But it gets you thinking about ways to save. Since becoming a mummy I’ve been charged with the role of Family Buyer and have definitely become more discerning with purchases. There are certain things I’ve found to be easily replaced with cheaper alternatives, and others I’ve found to be totally inferior when I’ve tried to stinge it. So I thought I’d share some of my tips for economical spending. (Remember, I’m not a businesswoman or accountant, I’m a mummy and a teacher and my maths skills are honed to a strictly Grade One level – patterns are my jam!). 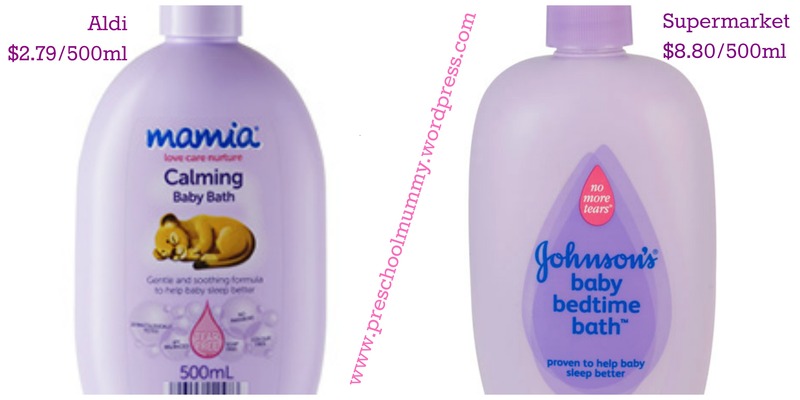 In true Aldi style, the company has released a baby body wash product packaged in almost the exact same lavenderlicious way as the market-leading competitor, which smells and lathers similarly, and is also gentle, but for a fraction of the price. I love it. That is all. Yes, Tupperware is an amazing product, with a reputable name and excellent warranty, but for a single-income family, decking out a pantry with the iconic brand (or even buying a set of lunchboxes) isn’t very economical. Especially when your kid attends a “wrapper-free” kindergarten (which I commend!) and has a term-one average of two food container losses per week. 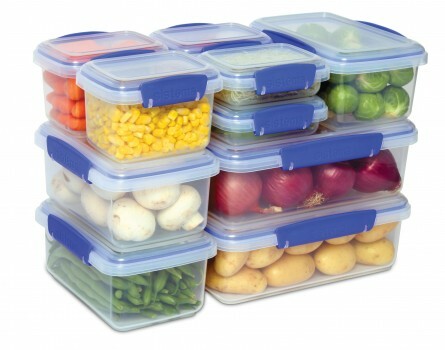 I buy Sistema Klip It containers from Coles. For a set, they’re $30 but often I grab them on sale for $15. They wash easily in the dishwasher, can go in the microwave and freezer, are BPA* free, and last for years. Find out why BPA is so nasty here. I also picked up an awesome cupcake transporter, which comes in so handy for birthdays at childcare or kindergarten, and transporting food to bring-a-plate events. Tupperware sell one similar but this was a bargain at KMart (Homemaker brand) for $15. Just remember, don’t go too cheap, as some of the bargain imported tubs (like those found in the $2 store) still contain BPA. Okay for the purpose of this post, we’ll call the boutique candle brand I’m talking about “Arthouse”, because I did enough law subjects at uni to know you can’t go talking smack about companies on the internets and presume you won’t be sued for defamation. Pretty pie-in-the-sky that they’d ever read this little bloggy but hey, you just never know. Anyway, for a good two years there I was shelling our $39.99 for a candle for everyone. In my own mind I was like Oprah. “YOU get a candle! YOU get a candle”. Anyway, you get the gist. Arthouse* candles were my go-to gifts. I don’t care if you were a man, a woman, a baby, hell I’ve probably considered giving one to a dog. Everyone got an overpriced candle in a glass jar with a lid. I thought I was pret-ty fabulous for being the giver of the gift of ambience. I was recently queuing in the florist to buy another friend another gorgeous candle, when a woman in the queue behind me eloquently exclaimed “Excuse me, I don’t mean to intrude, but if you’re thinking of buying one of those, I’d recommend against it. 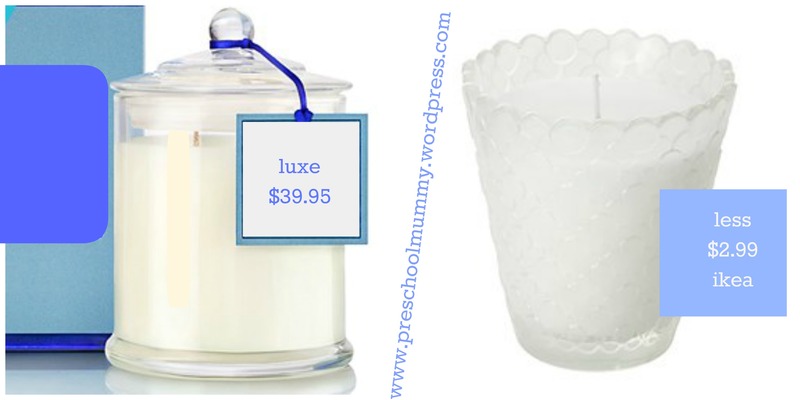 While they smell amazing in the shop, you light them at home and get nothing but disappointment.” I thanked her, realising that because there’s no way on earth I’d spend nearly $40 on a candle for myself, I’d never tested one out. 1. $39.99 is a stupid amount of money to spend on a candle. 2. Always give gifts that you’ve used yourself and love. 3. Buy your candles from Ikea. They cost under $6 and smell exquisite. They even come in a glass jar if that gets you excited. *I don’t wish to be sued today, thank you. 4. Hair cuts for squirmy little boys. Haircut week is the bane of my existence. The stuff nightmares are made of, that humiliating (and deafening) experience involving a wailing toddler sitting atop my knees, his head spinning from side to side Exorcist style, his hands swatting away the stylist’s clippers, his mouth a sticky mess of Mentos and clumped together blonde baby hair. His baby sister sitting in her pram doing her best WTF face, his four year old brother repeatedly protesting against his own imminent haircut. Of course it’s always on a weekday morning so there’s always a couple of “ladies of leisure” having their perms set, peering disapprovingly over at the circus that is my life, which is disrupting their salon experience. All the while I’m guessing at their thoughts, probably along the lines of “That poor young mother, she mustn’t know how to stop having babies”. I fight the urge to tell them we’re just Catholic, and then silently congratulate myself that I’m not pregnant. Yet. At the end of this ordeal I’m charged $38 for the privilege. Er, I don’t think so. After doing this kerfuffle for about a year, I discovered what my husband and I now affectionately call “a haircut in a box”, which I think could be one of the best reasons to visit Sunnybank (apart from the awesome Asian food, that is). You simply feed a $10 note into a machine, grab a ticket, get into the box and come out with a haircut. Okay, it’s not really a box, it’s a little tiny salon. The stylists are hairdressers and they’re good at what they do. They have screens showing retro cartoons to distract the children, and capes that look like superheroes’. The one we visit even has a seat shaped like a little Ferrari that the toddler can sit in while the hairdresser efficiently cuts his hair. $20 + twenty minutes = two happy, spunky little boys with stylish dos. Kerching! So go find somewhere that does cheapo (decent) haircuts and take a number! 5. Baby food for cheapskate (or health-conscious) parents. If you’re like us, it’s a little bit from Column A and a little bit from Column B. You know already that everything that you buy in bulk saves you money – eventually anyway, right? When we first got married I discovered my husband was compelled to keep dozens of extra toilet paper rolls in the linen press “Just In Case”. Five years later, we still have a stockpile of TP that will see us through a nuclear war or zombie apocalypse, even well after we run out of food and water (which I suppose will negate the need for TP). It’s amazing how reassured one feels knowing one has 60 loo rolls living with one’s towels and sheets. Anyway, I’m back from my tangent now! A mummy friend recently alerted me to the fact that you can buy 1kg of pie apple (100% fruit, no added sugar or additives) from Woolworths for $2.49. 1kg of fresh Granny Smiths cost around $4.99 from the same supermarket. There’s a lot of wastage from coring and peeling, before steaming your fruit. So it’s kinda like comparing apples with oranges (sorry, I had to!). With the pie apple I simply open a tin, blend and serve. I’ve tasted both, they taste exactly the same. You can do this with apricots, pears and other fruit too. Very cheap! I really love making my own baby food because it’s way cheaper than buying sachets or jars, and you can be assured of the quality of the ingredients. Vegetables are always cheap to make up for bub, if you buy seasonal veggies or those on sale. Farmer’s markets are a great place to shop for bargain produce too! Curash Baby Wipes – these are my favourite baby wipes, but at $5 a pack are quite dear. We buy these (brand name only) by the carton from group discount sites like LivingSocial, Groupon, Spreets, etc. I may not have much, but I have 16 boxes of OMO Sensitive under the laundry sink. Colgate ten pack. Way cheaper and also ensures you have a stock of spares for when you see your toddler stride past wearing a plastic construction hat and your toothbrush wrong side down in his nappy pretending it’s a hammer in a tool belt. Oh that’s just me? Spares for visitors, then. Rice crackers, sultanas, dried fruit, custard and yoghurt – I buy this all in bulk and then split it up either directly into the boys’ lunchboxes, into ziplock bags or into my Sistema containers. The mark-up on snack-packaged foods is totally ridiculous. I’ve noticed this even more since my eldest started kindergarten and they have a “wrapper-free” policy. Next Post My baby girl is hiding in this ad.